Students across Jefferson County headed out of their classrooms at 10 a.m. on March 14, as part of a national protest against gun violence in schools. Several hundred Lakewood High School students walked out of school in solidarity with students all over the nation, who are marking one month since the massacre in Parkland, Florida. Students lined up for more than a block along Kipling Street to hold signs urging action on gun violence in the country. Lakewood High School students lined up along Kipling Street for 17 minutes on March 14, in remembrance of the 17 victims of the Parkland, Florida shooting, which was exactly one month ago. Students chanted "This is what democracy looks like," and "not one more" as cars honked as they drove by. Several hundred Lakewood High School students lined up along Kipling Street on March 14, standing in solidarity with students all over the county and country who are remembering victims of gun violence. The school's staff and Lakewood Police were on hand to keep students safe and ensure traffic gave room to the students. Lakewood High School students head to Kipling Street at 10 a.m. on March 14 to hold up signs urging action on gun violence in the country. Many schools in Jefferson County and the metro area also participated in walk-outs to remember the victims of the Parkland, Florida, massacre. Students walked-out of Lakewood High School carrying a variety of signs urging action on gun violence on March 14, a month after the attack at Parkland, Florida. 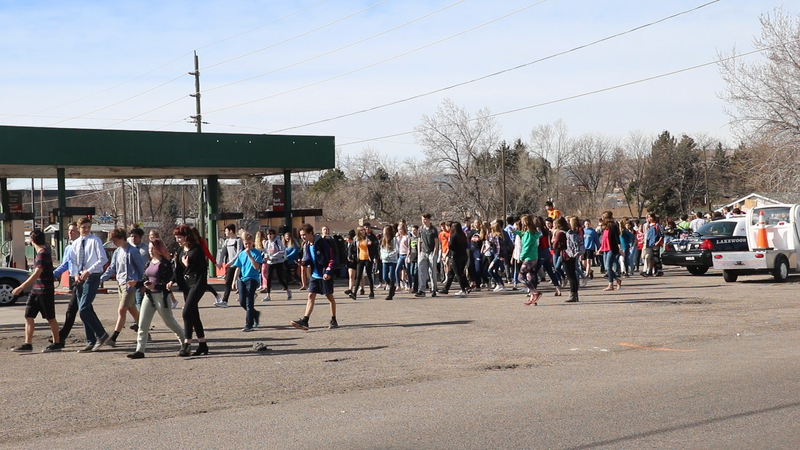 A stream of several hundred students leave Lakewood High School to stand along Kipling Street on March 14. The walk-out was one of many in the metro area to honor victims of gun violence. Student and teachers at Arvada West High School stood in silence on the athletic field of their school for 17 minutes to remember the students who died in Florida last month. The #Enough walkout at Arvada West High was held on campus to ensure student safety. The walkout at Arvada West High School was one of almost 2,000 planned across the country. Students at Arvada West High School gathered in an on-campus field March 14 during the National School Walkout. In memory of the students who died at Marjory Stoneman Douglas High School in Florida, students stood in the shape of a heart. Members of the Arvada community came out to show support for the students. Students from Arvada West High School walked out of their classrooms at 10 a.m. Wednesday, March 14 and made their way to an athletic field where they stood in the formation of a heart to show support for the students killed last month at Marjory Stoneman Douglas High School in Florida. The event was one of almost 2,000 happening nationwide as part of the #Enough National School Walkout to End Gun Violence organized by Women's March Youth calling for students and allies are organizing the national school walkout to demand Congress pass legislation to keep people safe from gun violence at schools, on streets and in homes and places of worship. Students across Jefferson County participated. At least nine district high schools had student-organized walkouts, including Columbine which was the site of a 1999 school shooting that left 12 victims dead. It started with just a few students standing out in front of Lakewood High School, but as 10 a.m. neared on March 14 – the few students turned into a group. And as they started heading toward Kipling Street, what had become a crowd of students turned into something else – a swell. The Lakewood walk-out was just one of many similar events held at schools all over Jefferson County, the metro area, and the country, as students are taking a stand on the issue of gun violence. Lakewood students protested along more than a block on Kipling Street for 17 minutes – in recognition of the 17 students killed in Parkland. The Lakewood event was organized by students by word of mouth and social media, said senior Logan Klutse. Students are taking the lead in the national debate over gun rights. Danborn was joined by many of her fellow students in expressing their concern of not being safe in schools and wanting change to happen and a higher level. The entire protest was planned to only last 17 minutes, one minute for each victim of the Florida school shooting. As the students stood in peaceful protests, cars honked as they drove by and a handful of community members stood nearby to show their support of the students.